The recent flowering of high-end boutiques on Lexington Avenue adds a different kind of vitality to the strip of asphalt and concrete long associated with mohawked, dreadlocked and buzz-cut-topped kids with metal bits and Birkenstocks and heaps of attitude on parade. Kitty Brown, owner of Sky People Gallery and Design Studio on Lexington, seeks to focus on the street’s financial potential. “Lexington Avenue should be recognized for its commercial viability,” Brown told me recently in her tattoo studio (Sky People also promotes local art and interior design). What’s more, they’re apparently here to stay. Accordingly, Brown claims to wield a laissez-faire organizational style wherein she delegates duties and events to different coordinators — and then trusts them to run with their instincts. “Each person has autonomy [over] their own component,” Brown explains. As might be expected, this year’s scheduled artists (all local, all exhibiting or performing original work) are vastly diverse, encompassing painting, sculpture, poetry, improvisational comedy and some weird hybrids best filed under “Only in Asheville” — plus sounds from chamber music to punk rock. One particular interactive exhibit should definitely draw a crowd. “The Class War Limo,” created by local artist Sean “Jinx” Pace, can be climbed on, pedaled (it’s loosely based on a rickshaw design) and even coaxed into playing tunes (thanks to a marimba located in front of the rider). The sculpture, Pace declares, demonstrates the efforts many workers must make for the enjoyment of but a few. Pace, who uses donated recycled material and calls himself a mind developer — rather than, say, a land developer — won first place for sculpture at the inaugural LAAFF art show in 2002. Last year’s piece, “The Deconstruction of a Piano Lesson,” incorporated a suspended pogo stick and an old, broken piano that unleashed mangled notes as participants jumped up and down. And jump they did. Such hands-on appeal goes a long way toward mainstreaming “scary” work, Brown muses. “People aren’t inclined to feel comfortable with emerging art because it’s different, and they don’t know how they should react,” she adds. Brown feels art like this should be fun — yet her belief in permaculture is serious business: Food-and-beverage vendors at LAAFF will all hail from downtown restaurants; you won’t even find a Coke at this festival — only fresh lemonade, tea and beer from area breweries. “Use what you have,” says Brown simply. 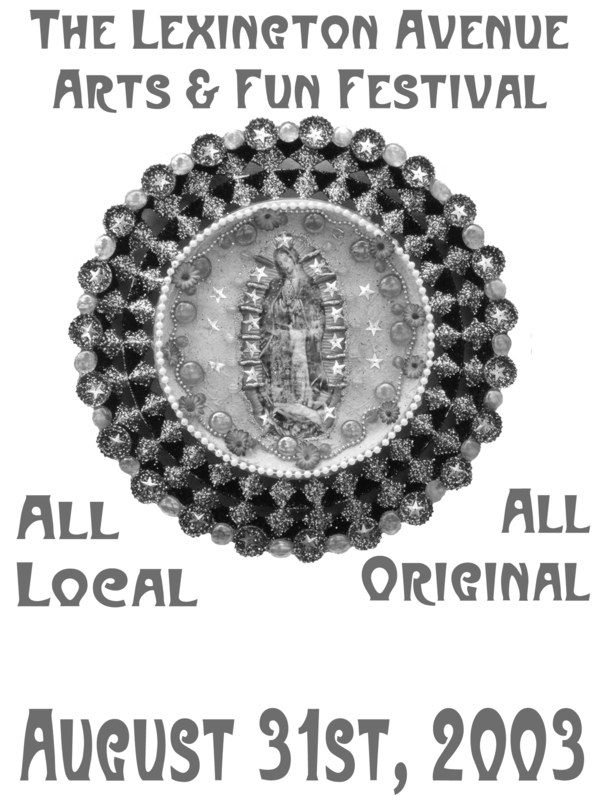 The local slant also embraces two nonprofits, both of which stand to benefit from fund-raising at the free festival. The Asheville Mural Project, meanwhile, is a loose affiliation of artists who hope to transform the face of the city’s public art. And such a change can only develop street by street. Robinson sings, and plays bass and keyboards — the latter with his foot (what else?). “I really like the idea of [LAAFF] being a community-based thing,” he goes on, “because some of the coolest people I’ve ever met live here. The second annual Lexington Avenue Arts and Fun Festival (spanning the 240 exit on the north end up to College Street) happens Sunday, Aug. 31 from 11 a.m.-10 p.m., with more than 25 local acts scheduled to appear on two stages. Highlights include Devilish Mary (all-girl string band with Cary Fridley, performing at noon); The Oxymorons Comedy Troupe (4:50 p.m.); rising rock stars Drug Money (7 p.m.); West African drum-and-dance group Ballet Warraba (7:20 p.m.); and celebrated burlesque troupe The Rebelles (9:45 p.m.). For more information, call 232-0076.